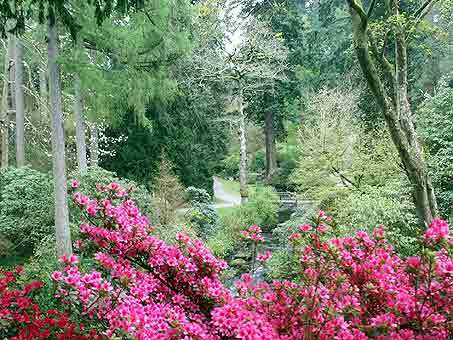 Bodnant Garden has often been described as the finest in Wales and has been voted one of their favourite gardens by National Trust members. 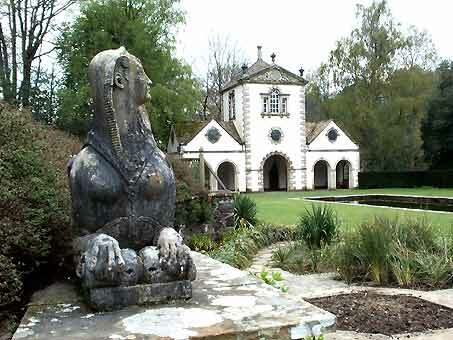 The Garden at Bodnant is mid-way between Llandudno to the north, and Llanrwst to the south:- (Landranger Grid Map Reference SH795725). National Trust and RHS members are admitted free on presentation of their membership cards. There is a Garden Centre on site with many of the species in the gardens available for sale. Bodnant Hall (picture 1 above) is the residence of Lord Aberconway. The house was built in 1792 and is not open to the public. 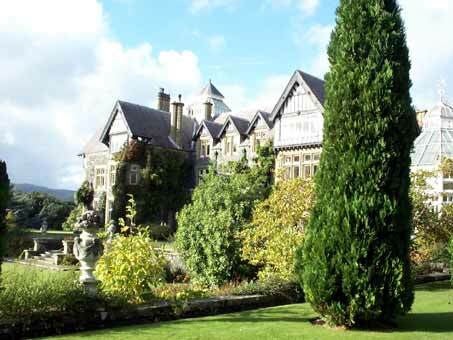 The gardens cover 80 acres, have magnificent views of the Snowdonia mountain range and a variety of features, from formal ponds to magnificent woodlands and streams. 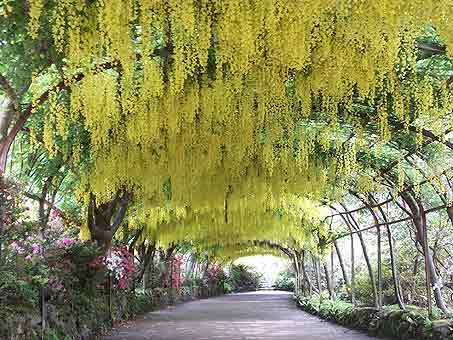 The laburnum arch (picture 4 above) is a 55 metre long tunnel. It is close to the main entrance, and normally flowers from late May to early June, when it is a mass of yellow blooms . The laburnum arch photograph above was taken on 29th May. 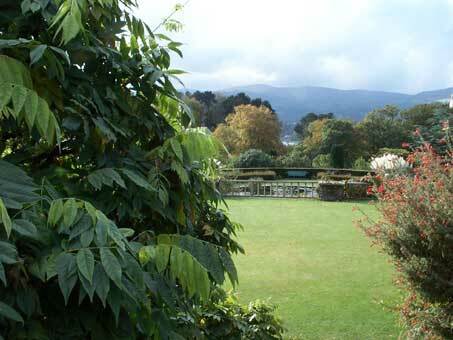 The upper gardens consist of terraces, and both formal and informal lawns. There are spectacular views over the Snowdonia mountain range. 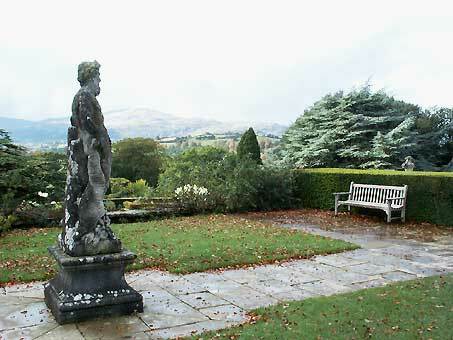 The sheltered herbaceous borders in picture 1 are close to the entrance and Bodnant Hall. The Sphinx overlooks the Canal Terrace and the Pin Mill. 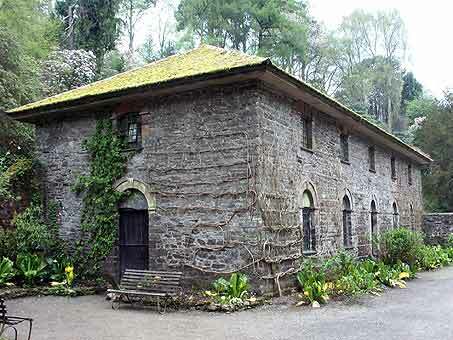 The mill (circa 1730) was rescued from Gloucestershire in 1938 and was rebuilt at Bodnant. 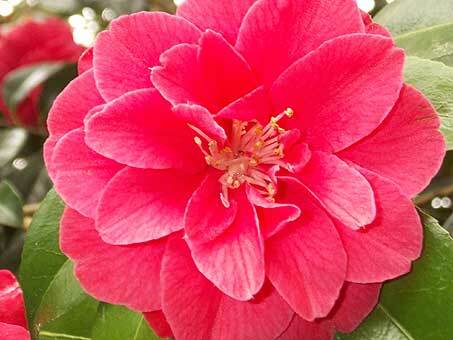 In spring the gardens are a mass of colour - including the brightly coloured camellias (above) azaleas, rhododendrons and magnolias. 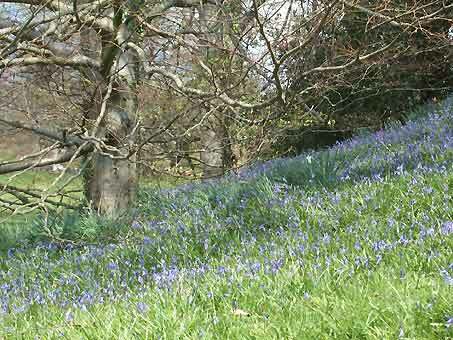 In late April, banks of spring bluebells cover the Chapel Dell and the trees are a riot of colour. 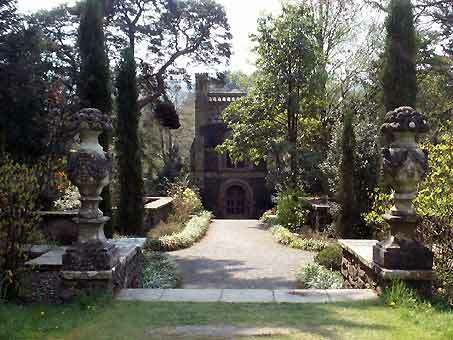 The Mausoleum (picture 3) can be passed on your way to the lower garden and the Dell. For those unable or unwilling to descend to the lower garden there are viewing points at higher levels that give fine views over the Dell, as evidenced in picture 4. 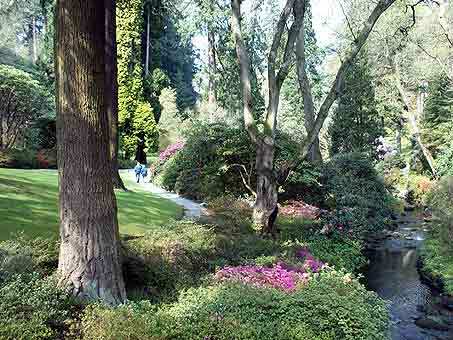 The lower garden contains the wild garden, spring flowering bulbs, shrubs and the mill pond. 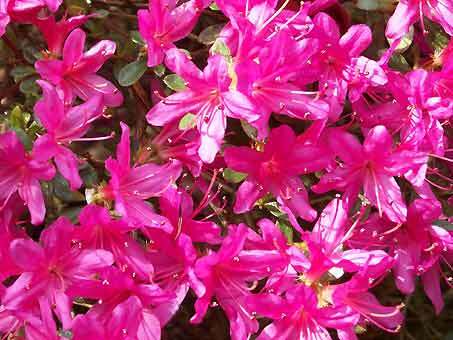 Azaleas were in full bloom when we visited in late April. 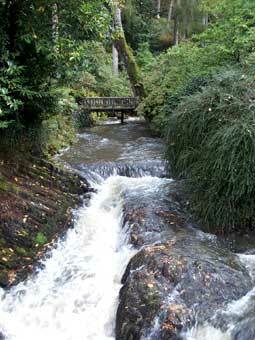 The mill race (picture 4) leads to The Old Mill, pictured below. The 'race' was used to power the flour mill and a sawmill. 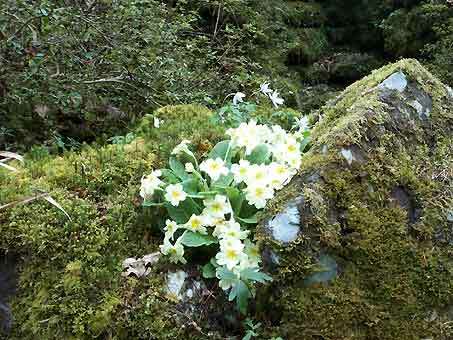 For those who are able, the Dell is well worth the descent, either via a steep slope or a longer route that takes in the Chapel Park, flower beds and shrubberies. 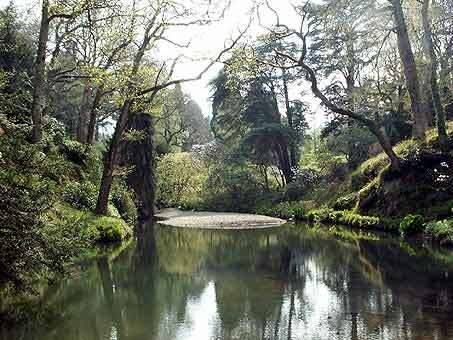 The Dell is a tranquil area with shaded walks by the side of the River Hiraetlyn, a tributary of the River Conwy. 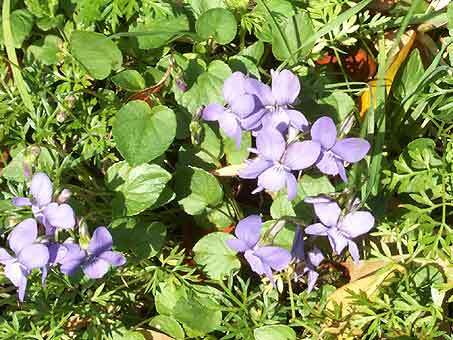 Violets thrive in these conditions, as do summer plants such as hostas, astilbes and ferns. 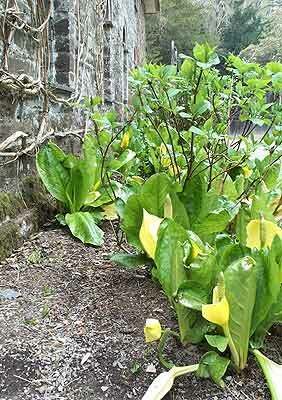 Skunk cabbages (picture 3) have been planted by the side of The Old Mill. 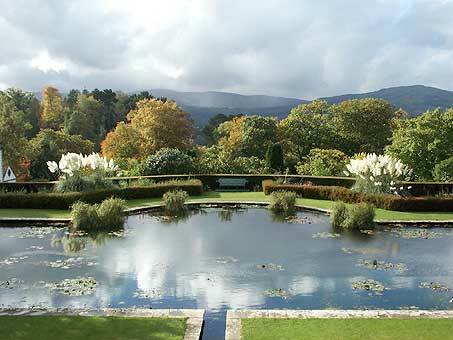 If you have not visited Bodnant Garden, put it on your list of 'Gardens to Visit'! 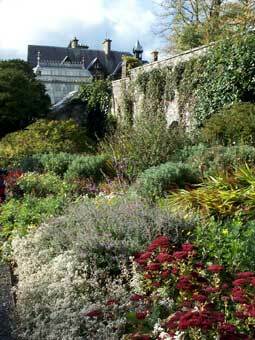 Bodnant Garden's own Guide Book "The Garden at Bodnant" has masses of pictures and information, including a monthly diary of notable plants to see, plus a history of the garden and buildings. 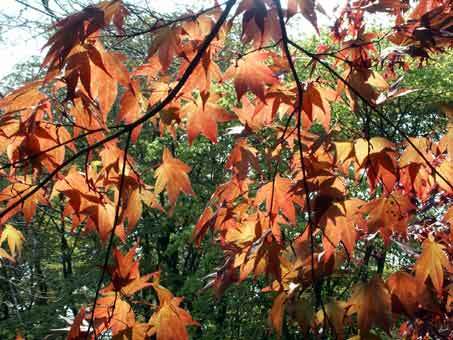 The pictures above have all been taken either in late April or at the end of October, by the webmaster of Beautiful Britain. Other National Trust properties so far on this web site include Biddulph Grange Garden in Staffordshire and Culross Village in Scotland.